Taxi drivers in just about every region of Quebec are on strike Monday in an effort to urge the Quebec government not to pass Bill 17, which would deregulate the taxi industry. In Montreal, Quebec City and Laval, drivers organized slow-rolling protests to disrupt the flow of traffic. In Quebec City they were protesting in front of the National Assembly, blocking a major boulevard, honking horns and waving placards, while in Montreal, they took to Highway 20, slowing the pace of morning traffic. Last week, the provincial government tabled Bill 17, which is aimed at evening the playing field with ride-sharing apps like Uber by allowing taxis to charge variable fares and eliminating paperwork and fees. Some in the industry said they see the bill as a way for the government to favour those very apps. 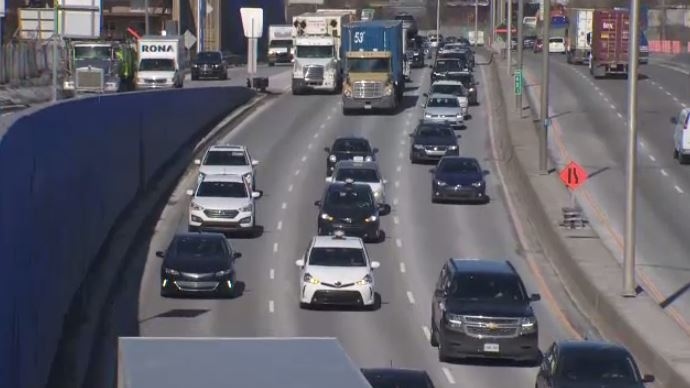 “There’s nothing to change – we just want it abolished,” said George Boussios, President of Taxi Champlain and spokesperson for Taxi Grand Montreal. Taxi drivers said there were better options than deregulation. Taxi Co-Op de L’Ouest driver Souheil Saade said the matter is about who follows the law and who doesn’t. “We follow the law 100 per cent and they’re still against us and Uber doesn’t follow any law,” he said. Some drivers said that the $500 million that will be given to drivers as compensation doesn’t do enough, given the fall in value of taxi permits over the past few years. Saade said the rise of Uber has forced drivers to work longer hours to make a living. Bonnardel reiterated his stance Monday, adding that drivers will not see a penny more in compensation. "Half a billion is a lot of money. It's a final amount for us," he said. "It's a bill that we tabled for the client first, and like I said, it's to find a balance between the new technology and the taxi industry as we know it for 50 years in Quebec." Boussios said the taxi industry's goal isn't to eliminate ride-sharing apps, it's to be more competitive. Boussios pointed to the measures the industry has taken in recent years, including implementing an app, moving toward using hybrid vehicles (80 per cent of the taxi fleet is hybrid, Boussios said), and using uniform signage on taxi vehicles. “We followed all the rules and regulations – in good faith, I may add – and they just turned around and said thank you for spending all that money on apps, thank you for spending all that money on your call centres… and spending money on hybrid cars… thank you so much, but we don’t need you anymore,” he added. Since Uber's Quebec launch in 2014, Montreal's taxi drivers have found themselves in a difficult situation. The drivers protested repeatedly, demanding the provincial government take action to protect the industry. In 2017, the then-Liberal government announced new measures for Uber, including expanded background checks and mandatory training for drivers. Taxi drivers on Highway 20 east slowed traffic to protest Bill 17.